When’s the last time you tried opening a kitchen drawer just to find it jammed with utensils, tools, and random items that you can not remember making their way into the drawer in the first place? If you are lucky to get the drawer open, you are likely to spend the next few + minutes rummaging through the tools, trying to find the one you need. Sounds familiar? I bet we all have a drawer like that. The solution? Organize, de-clutter, clean, etc. The marketplace has a vast variety of tools for the job – drawer dividers, containers, boxes, you name it. But have you thought about using something that you might already have in the kitchen? How about loaf pans? Today, when cleaning the kitchen at the work studio, I pulled out a few of the loaf pans that we hardly ever use to organize one of our drawers and it worked out great! Peelers went into one loaf pan, the other one was filled with scoops, and whisks and peelers found a new home. Now when we open the drawer, it actually opens and we can find everything that we need neatly organized. 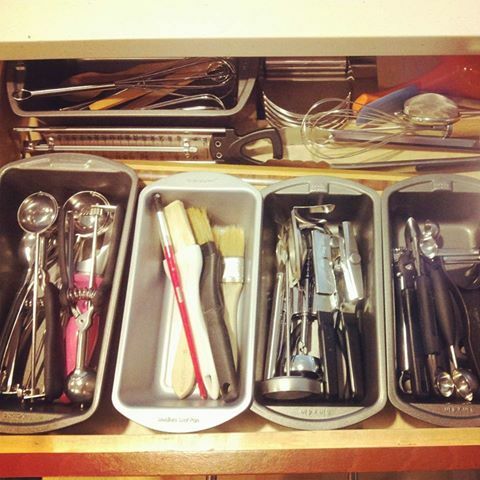 Want to share your trick for organizing kitchen drawers?